The focal point is the central design element that draws the eyes attention. Strong architectural elements, such as fireplaces, large windows, and built-in bookcases, naturally attract the eye, but so do large furniture pieces, such as entertainment centers and large sofas. The problem comes when you have two or more of these strong elements in the same space. Too many focal points means that the eye has no place to rest, which leaves the viewer feeling anxious and uncomfortable. The first step to dealing with multiple focal points is to choose the element that you want to draw attention to – and the next is by checking out the pictures below for more tips and ideas. 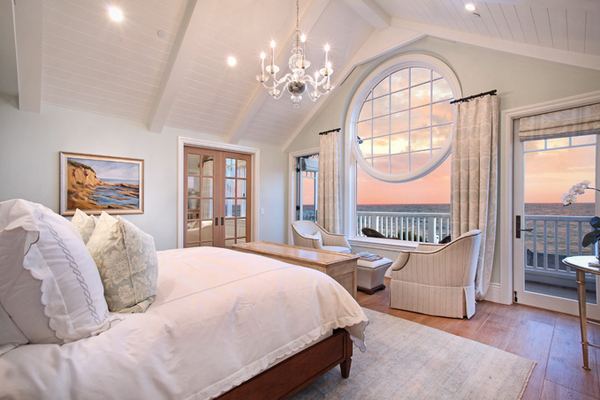 Windows in bedroom don’t need to be huge to take advantage of views – but if you are inside this bedroom, well, just take in the view! Look at the windows versus trim versus wall color. Lovely! The cabins were pre-fabricated, barged to the site and assembled during a couple of snowy weeks in January. The big overhanging hip roofs with cedar ceilings provide plenty of shelter on the often rainy Sunshine Coast. Love the focus on the views but also the clean and simple design that focuses on the view. The headboard of this large stunning bed sure is beyond words – even the ceiling treatment of this bedroom is divine! 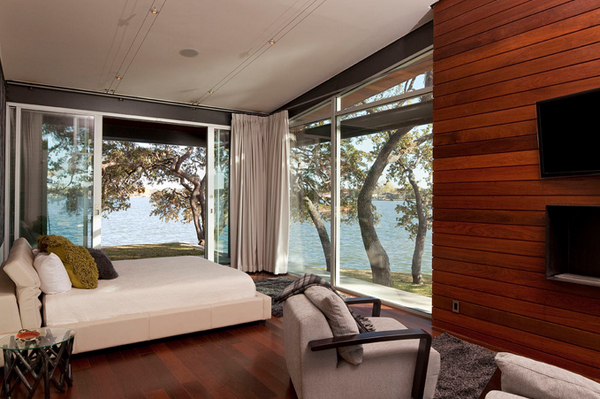 This serene master bedroom was inspired by the fabulous views of Lake Erie and its ever changing tones. 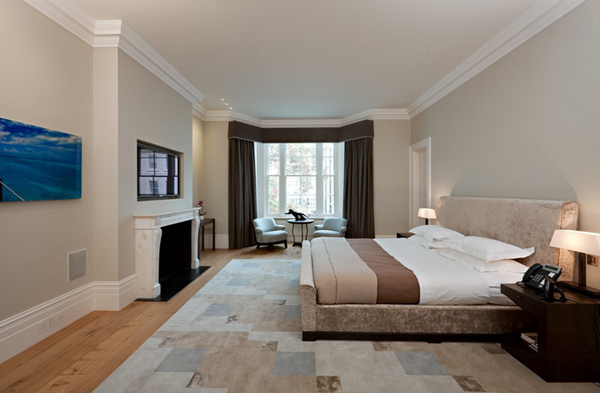 The custom upholstered headboard and nightstands were finished in sandy neutrals to offset the deeper toned walls. Like the simplicity of the curtains and pelmet. 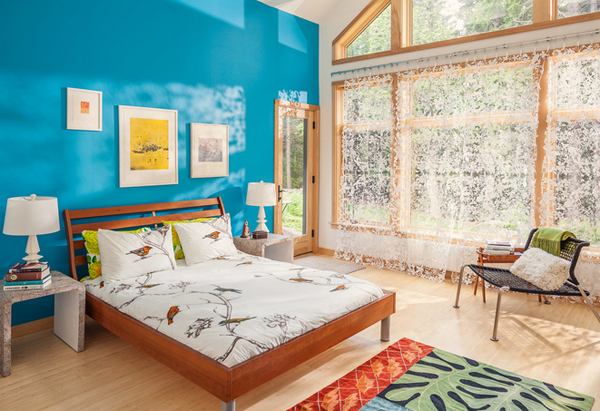 This bedroom is a study in how to use different intensities of the same color. 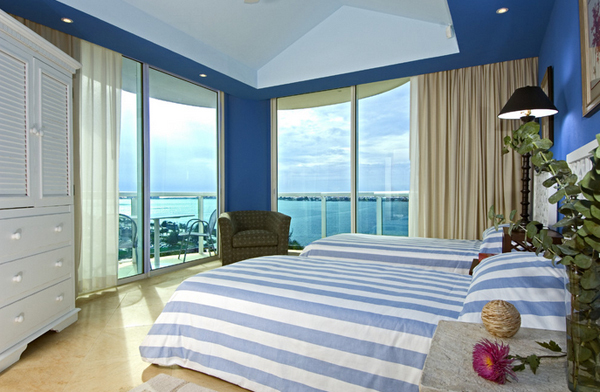 Sky-blue stripes on the bed give this ocean-view room a nautical touch. 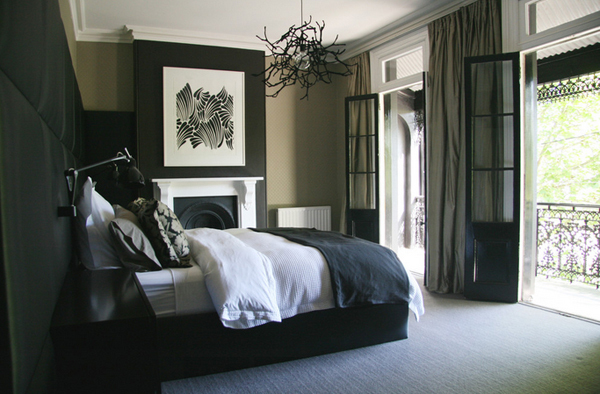 This bedroom illustrates a nice trick when using a deep, dark hue: Limit it to the ceiling and one wall. 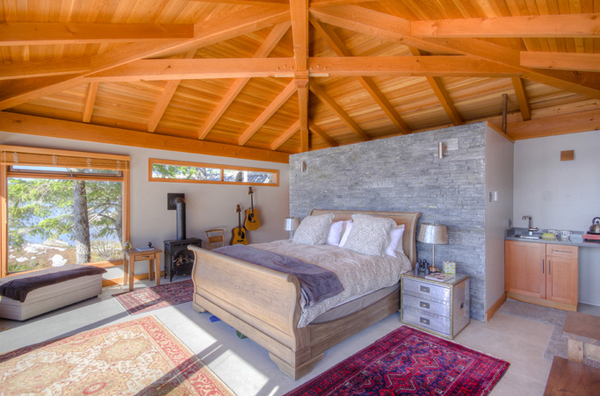 It looks less jarring than painting one wall only, and it helps bring the ceiling down, creating a cozy and intimate effect that’s perfect for the bedroom. 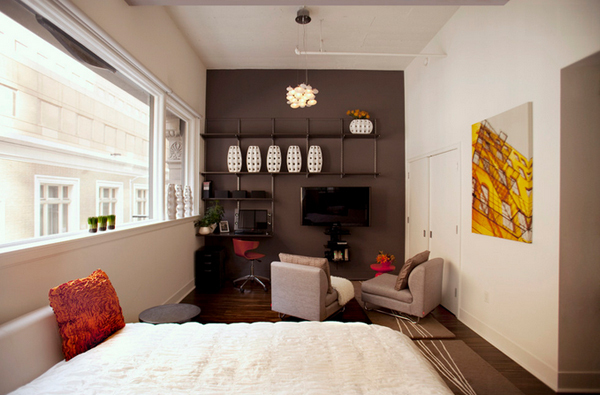 When using a bright, bold paint color in a bedroom, I tend to limit it to a single accent wall. The headboard wall usually makes a nice focal point in the space, so that’s a good choice for receiving the eye-catching color. The spiral stair provides a striking visual focal point and elegantly divides the modest-sized ground floor space into different use areas: a bedroom and library. A continuous stepped shelf along the back wall makes a flexible place to display art objects. 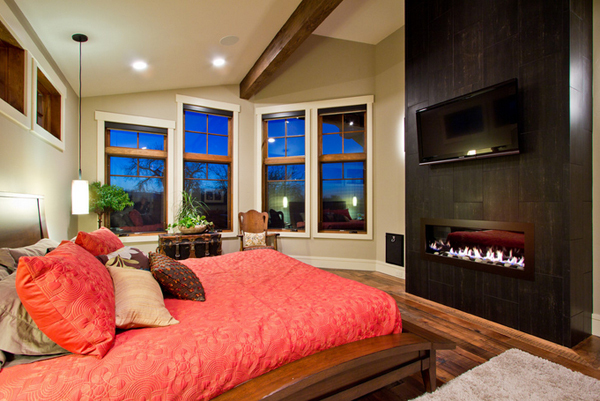 Love the cozy feeling of the room; the dark wood combined with the light bedding, the flat walls combined with the wainscotted ceiling, area rug on darker wood floor. Look closely at this feature wall and you’ll notice it’s actually three in one – a subtle plaque design within a feature panel within the original wall color. The dusky mauve color scheme keeps the whole look understated and elegant. I could almost tell you the color of the exterior of this house without seeing an exterior photo. Colors from the same palette allow you to create a mood. In the same studio, the designer used a shelving system to hold items and work as an office space. It’s much more compact than a bureau, and leaves the floors wide open. 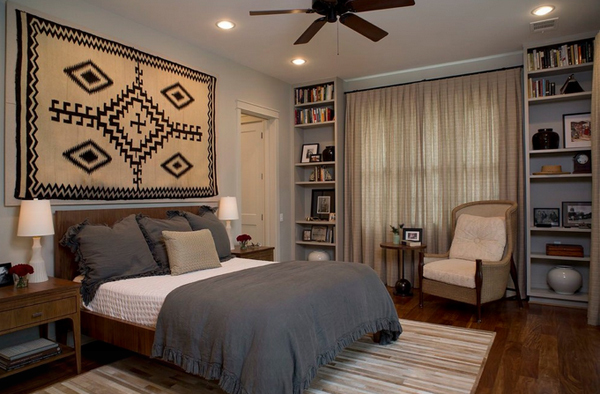 The simple graphics of a Zapotec rug give interest to this traditional bedroom with neutral tones without throwing off the balance. Of course, if you are going with black and white, you can add other interest through texture and materials. Here the antiqued gold mirror, chrome tray stands and plants enrich the collection. If you want to dip your toes into the patterned-lampshade pool, try a tone-on-tone print. The lampshades next to this bed add only a hint of interest. 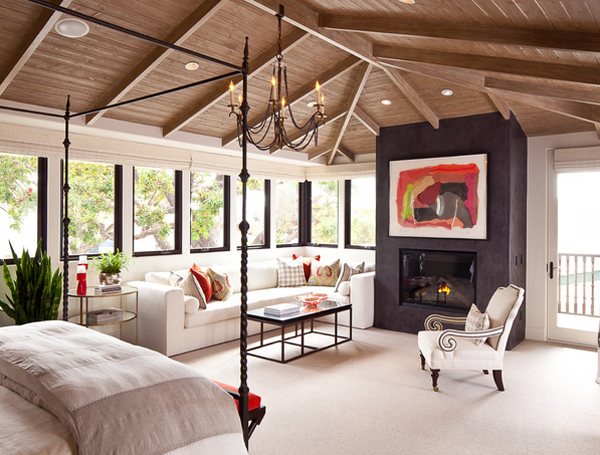 And there you have it, the list about bedrooms with two focal points – we have made a few lists about home spaces with two focal points and you can see them in our site like living rooms with two different highlights. Every room and situation is different, but here are basic guidelines for dealing with multiple focal points when designing your living space. More to come in Home Design Lover!